Lest you think all I do around here is eat, here’s a glimpse at a pair of clothing projects. I have a beach vacation coming up, and I need swimsuit coverups that are more stylish than an oversized Brewers T-shirt (charming as it may be). I want coverups that go from beach to cafe and shopping with ease. I thrifted these garments at the West Side Savers in Madison. Picture this tan coverup in maroon. This is an XXL juniors knit top with unfinished edges. It ties in the back to define the waist, and it’s a good, youthful length. But I’m not keen on the color. This tan washes out fair ladies like myself. 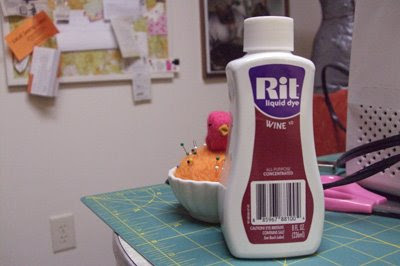 My plan is to dye it wine with Rit. I’ve never used Rit, so this should be an adventure. The sink (or container) directions call for stirring the fabric, dye, and hot water for 30 to 60 minutes and then rinsing the fabric until the water is clear. I’m wondering how messy this is going to be. What’s been your experience with Rit dye? Will it dye the container? Will it dye rubber gloves? How messy is this stuff? It’s a great color, but this coverup is too long. This is the other coverup. I like the spaghetti straps and the color, but the length makes me look a bit stumpy. My plan is to shorten it and maybe trim the hem with a ribbon. I like the raw hem on my other coverup, and I’m kicking around the idea of raw hem on this garment, too. It would be really easy. I considered trimming the too-long ties. They got into a terrible knot in the washing machine. But as I did this photo shoot, I experimented with wrapping and tying them in different ways. Guiding them under my bust, around my back, and back around my waist used up a lot of the length, and it helped define my waist in an otherwise shapeless dress. I think it looks a bit Grecian, which is appropriate for the beach, don’t you think? Around the neck probably is the “right” way to use these extra-long ties.